IP-address of the server: 77.221.146.232. Domain era-z.ru, at the time of scan does not use the free service management DNS UANIC. Domain era-z.ru properly delegated or website is not available! The estimated cost of the website era-z.ru is $1 405. 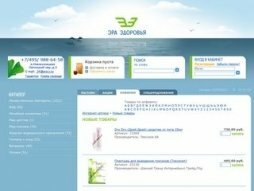 Website era-z.ru, tentatively, brings its owner an income of $87.9 per month. Очень хорошая и качественная мебель, а главное не дорогая. Все полностью передрано с petro-mag(at ua) Некрасиво так.